PORTLAND, Ore. — The Harrington Family Foundation (HFF) will hold The Great Summer Chef Off on July 26 starting a 6 p.m. The inaugural event, to be held at Bladberry Farm on Sauvie Island, will bring together five Portland chefs for a BBQ cook-off event to support the Foundation and its mission to better the lives of children in Oregon by giving them access to high-quality education and health care. The event will also include a silent auction and raise-the-paddle segment. Presented by Parr Lumber, the cook-off will feature food prepared by Greg and Gabrielle Denton, Ox; Rick Gencarelli, Lardo; and Chris Thompson and Hilary Benson, Iorio. Farm-to-cone ice cream from Salt & Straw will be served for dessert. Beer, wine and whiskey tasting will also be part of the evening with beer provided by Migration Brewery and wine tasting coordinated by Domain Drouhin. 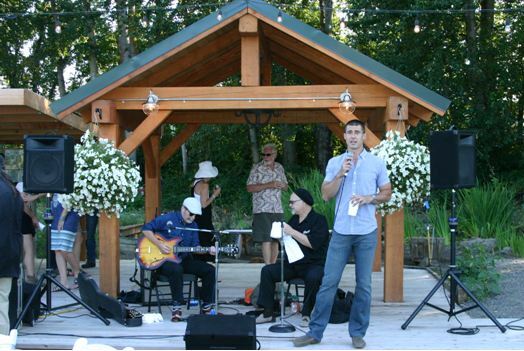 Blues singer Curtis Salgado will provide live entertainment for the evening. Tickets to the event cost $125 per person and can be purchased online. Event tables (10 people) may also be purchased for $1,000. Only 400 tickets will be sold with all proceeds going to the Foundation and its mission to support children in the state. Guests will also be able to cast their votes for the chef with the best BBQ, who will donate $5,000 to an Oregon children’s charity of his or her choice. The Foundation holds a number of other fundraisers each year to raise money for children, including two annual golf tournaments and Bridges to Breakers, a bike ride from Portland to Gearhart. New this year, the Foundation started the Oregon Community Quarterback Scholarship program that allows emerging student leaders facing financial hurdles the opportunity to attend an Oregon university, college or trade school. HFF was created by former NFL quarterback and Portland native Joey Harrington. Since its inception in 2003, the Foundation has donated more than $1 million to Oregon nonprofits that support education and health care for in-state youth. Established in 2003 by former NFL quarterback, Joey Harrington, the Harrington Family Foundation (HFF) has raised more than $1 million for students across Oregon. Born and raised in Oregon, Joey believes investing in Oregon students dedicated to pursuing higher education ultimately invests in the state of Oregon. He recognizes leaders do not only exist on the athletic field or in front of a television camera. The Oregon Community Quarterback Scholarship program is designed to encourage students who have shown a take-charge ability in their communities, but may need help reaching their potential. The Foundation recently opened a new office located at 1355 NW 13th Ave., Portland. For more information, visit www.harringtonfamilyfoundation.org. PORTLAND, Ore. — The Harrington Family Foundation (HFF) announced today the new Oregon Community Quarterback Scholarship program. Four, four-year renewable scholarships for $2,500 will be awarded to Oregon high school students who demonstrate outstanding leadership skills and will attend an Oregon university, college or trade school during the 2014-2015 academic year. The Foundation is making an annual commitment of $40K in perpetuity with the intent to grow with additional partners. Established in 2003 by Portland native Joey Harrington, the Foundation strives to support Oregon-based nonprofits dedicated to providing education and healthcare to in-state youth. Harrington, former NFL quarterback and University of Oregon standout football player, started the scholarship fund to support Oregon high school students who have shown a take-charge ability in their communities, but may need help reaching their potential. In order to be eligible for the scholarship, applicants must achieve a high school diploma or GED; commit to attending an Oregon university, college or trade school in the 2014-2015 academic year; complete either the SAT or ACT standardized test; and demonstrate financial need. For a full list of eligibility requirements and to download a copy of the application, visit the Foundation’s website. Incomplete applications will be disqualified. The Scholarship Advisory Committee will select scholarship recipients based on 45 percent application, 45 percent financial need, and 10 percent on “something special.” To be considered, all applicants must complete and submit the scholarship application form, along with a one-page personal essay and two letters of recommendation, by 5 p.m. April 14, 2014. Scholarship recipients will be notified by May 1, 2014. Since its inception in 2003, the Foundation has donated more than $1M to Oregon nonprofits that support education and healthcare for in-state youth. Harrington graduated from Central Catholic High School in Portland where he was awarded the Holy Spirit Leadership Award in 1997. He went on to attend the University of Oregon from 1998-2001. As a quarterback for University of Oregon, Harrington finished his college football career as a Heisman Trophy finalist in 2001. He was the third overall pick in the 2002 NFL Draft, and went on to play professionally. Established in 2003 by former NFL quarterback, Joey Harrington, the Harrington Family Foundation (HFF) has raised more than $1M for students across Oregon. Born and raised in Oregon, Joey believes investing in Oregon students dedicated to pursuing higher education ultimately invests in the state of Oregon. He recognizes leaders do not only exist on the athletic field or in front of a television camera. The Oregon Community Quarterback Scholarship program is designed to encourage students who have shown a take-charge ability in their communities, but may need help reaching their potential. For more information, visit www.harringtonfamilyfoundation.org.